HUGE HUGE PRICE REDUCTION as of today, as the owner, whilst by no means needs to sell, is not using the boat and wants to see his baby sold &loved by a new owner. Make NO mistake, and I mean this, this is one MASSIVE VOLUME boat for the money, & not only that is in PERFECT AND I MEAN PERFECT CONDITION. If you wanted to build this boat, or something similar, you would be without question spending over $5 - $6m and delivery in 18 months . "MV Allure" is here now and just ready to take your mind off the worlds problems, and let you simply escape knowing the only real decision you need to make is what part of Australia do I want to go to next, and what time can I open my first beer/ bottle of Sav Blanc ! 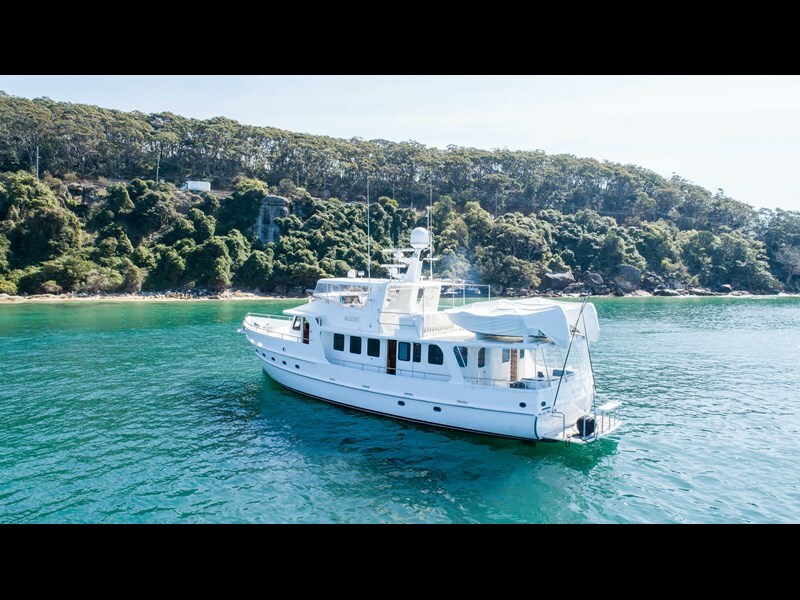 Without reservation, this is a true live aboard opportunity and any inspection will not disappoint. There is a deal in the air for an astute buyer and we invited GENUINE real cash offers. "MV Allure" - A new exclusive listing for SBM and one I am again so grateful for. Being a boatie and just loving all things floating that not only have been built for a purpose, but maintained to the HIGHEST level, MV Allure offers everything and more to the true boating connoisseur. I inspected this boat a few weeks ago, and my mind went into immediate overdrive as to what I could do with this boat, and the extended cruising she offers. Being a mad Barra fisherman, this boat is just oozes far North Qld as her home to be, as the current owners have made a lifestyle decision to now explore the inner beauty of Australia by RV, and hence it would kill them to see their baby lay dormant and not used. The current owners have travelled extensively on MV Allure, with live aboard trips extending over 5 months ! The boat has so much redundancy it is not funny, there are back up pumps for the back up pumps, she is that well built. She recently has a major Refit with Norman Wright and Sons Pty Ltd .
"MV Allure" has to be inspected to be appreciated, and with a replacement cost of well over $6m, she offers amazing value, given there is not a cent to spend. The owner has spent $$$$$$$ recently ensuring the boat is A1 condition and this is reflective of her immaculate condition from bilge to helm in every respect. 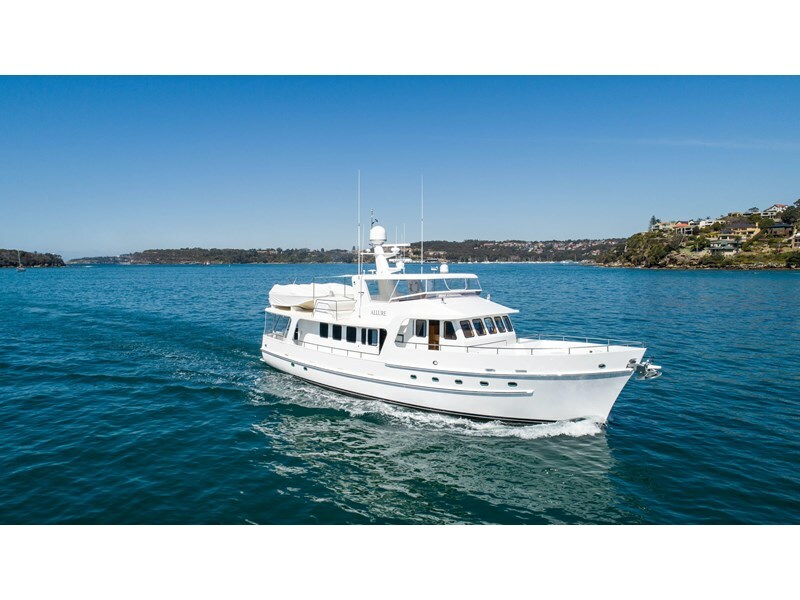 Asking $ 2.79 m . This Stunning boat is available at SBM now at the Spit Mosman. Please cut and past this link into your URL and enjoy MV Allure video! Allure's hull is constructed from two inch Spotted Gum to the gunwale and Oregon above the gunwale. This is a Timber planked boat built so well you can not tell its timber. This boat is a masterpiece and has been designed and built for long range cruising. The vessel is powered by twin 3406 Caterpillars that have done approx 1540 hrs and 1566 hrs. The fuel capacity of approximately 12,000 litres provides for extended cruising. It cruises at 10 knots all day long. You can eat your dinner off the engine room floor; the engine room also accommodates a Dolphin desalination unit that supplies fresh water to the 5000 litre capacity water tank. There are two 60 KVA Hino Generator sets that provide power to the vessel. The vessel also is fitted with Model 302 Naiad Stabilisers that provide a very comfortable ride in ordinary conditions. There are 4 Cruisair Air Conditioner units that provide air to the total vessel. The vessel has incredible refrigeration capacity, fridge, freezer and Fruit and Vegetable units in the main galley. There is a drinks fridge on the rear deck as well as another one on the fly bridge level. In the rear Lazarette there is two very large freezers as well as an icemaker. The main refrigeration unit is a very serious unit there is also a secondary smaller unit as a back up in case of an emergency. REAR DECK / Duckboard / Lazarette. Rear deck Table that sits 8. Storage under the seating, including a water pressure blaster. Duck Board with Fish cleaning facilities and Outriggers, salt water and fresh water taps / hoses for cleaning down. There is a cabinet alongside the rear deck fridge that houses bottom fishing rods and rain jackets. There is also a rod holding rack that holds about 15 rods. The Lazarette is also home to a dive compressor for filling up Scuba tanks. There is shelving in the Lazarette that holds about 30 large plastic bins for storage of extra food or whatever. A chefs delight. This is a commercial kitchen that has everything at your finger tips. Large 900mm Waldorf gas oven and Cooktops, BBQ hotplate, Roband Salamander, Panasonic Microwave, F&P Dishwasher drawer, Lazy Susan, extractor fan, Pantry and much more. The Galley floor is Queensland Rosewood and Silver Ash decking. This decking is also featured in other areas throughout the vessel. No matter where you are on the water you can enjoy sport, news or any other event on the Satellite TV in the saloon. There is also a Dining table that sits 10, lounge area, a Bar and Sound system to enjoy your favourite music. For added safety in remote areas there is a double up of GPS, Radar, Sounder units.The vessel is fitted with a Furuno Nav Net system and Furuno Auto Pilot. There are two Radar units, one 48 mile Furuno and one 96 mile Arnitsu unit. A Furuno and a Nobletec navigation system. ITIM Fire Protection system, Floscan Fuel monitoring system, Cassens and Plath Compass as well as a Nabsco Search / Spot Light, Sat Phone, Bow Thruster, Codan HF and VHF Radios, Furuno Sounder. The vessel is also equipped with a five camera Surveillance monitoring system. Inquire today for a complete inventory. Don't be mistaken, this is one stunning motor yacht that will allow you to start living and chase those dreams you have wanted to fulfill since a kid - and you can do it now before it is to late ! We look forward to showing you on board and your inquiry for a complete inventory. Current Marine Survey available has been undertaken and available to buyer once a offer & Acceptance is in place. CUSTOM BUILT CABIN CRUISER $89,000.00 Quality & craftsmanship. Built by renowned English craftsman boat-builder Bernie Dale on the premises of Lakeland Marine Taupo in the 1990s. A displacement 36ft (10.9m) cabin cruiser designed for Lake Taupo with a hull of double diagonal kahikatea, glassed over with a laminated kauri interior. Powered with a QD 32 diesel 3.2litre, 4 cylinder 95-100HP engine with 80 hours use. The gearbox is a Volvo Penta MS 4B ratio 2.63:1 Regularly serviced. Comes with a 9.9HP 4Stroke Yamaha auxiliary motor. A 12ft beam at the widest point accommodates a walk-around passage with heightened railing, S/S roof rack with 80 watt solar panel and dinghy/kayak storage. The interior supports a forward cabin, port bunk cabin, starboard bathroom w/toilet, handbasin, full height shower. Main cabin contains 2 north/south beds which can be pulled out to make wider. Rear deck offers gas and fish storage, access to stern gland, music speakers, canvas shelter with NEW plastic windows. Sleeps 6 with a PAX of 10 plus for day trips. Fuel capacity 2 x 125 litre balance diesel tanks. Weight approx.. 4.5 5 tonnes. Comes with: A full list of chattels. Windlass Rinnai gas water heater Solar panel 80 watt Stereo Electric toilet VHF radio Dometic fridge Propane fume detector The cabin cruiser has been commercially surveyed. Ownership history available. Call for an appointment to view.